South West China, Myanmar and Northern Vietnam contain one of the oldest exposed outcrops of limestone in the world. Within this area are thousands of caves and gorges. It is only recently that botanists have sought to explore the caves for plants. This exploration is yielding many new species new to science, that are known only from these habitats. The current study was published in the open access journal PhytoKeys. Kew botanist and nettle expert Alex Monro says, "When my Chinese colleague Wei Yi-Gang from the Guangxi Institute of Botany first mentioned cave-dwelling plants to me, I thought that he was mis-translating a Chinese word into English. When we stepped into our first cave, Yangzi cave, I was spell-bound. It had an eerie moonscape look to it and all I could see were clumps of plants in the nettle family growing in very dark condition." The plants do not grow in complete darkness but do grow in extremely low light levels, deep within the entrance caverns of the caves (sometimes, in as little as 0.04% full sunlight). The British and Chinese authors have been collecting plants from the Nettle family in this limestone landscape for several years and have just published a paper describing three new species, one from a cave and another two from deep gorges. 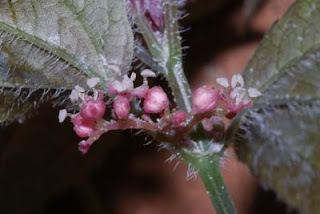 The cave-dwelling nettle species in question, was found growing in two caves in the Guangxi province of China. Of the species discovered in gorges, one is known from an unusual and striking rock mineral formation called petaloid travertine. Petaloid travertine is a form of limestone deposited by mineral springs that over time forms large petals of rock, in this case clinging to the vertical walls of a gorge. These plants are members of a genus of Nettles known as Pilea, that is believed to have over 700 species Worldwide, up to one third of which may remain undescribed.